While I was a professor at Michigan State University, I rented a small but delightful house on Park Lake. For more than four years, I watched rain and sun, clouds and clear skies, sunsets and sunrises, and migratory flocks of waterfowl, come and go. It was a wonderful place to live. It was also an excellent place for photography. One winter the lake was frozen solid. That February, snow from a series of storms was piled into low ridges. All that remained of the summer’s cattails were a few short stalks. A small group of them stood out on the ice, cut short by sharp winds and weathered by piercing winter cold. Powerful gusts drove wisps of bone-dry snow along the ground, whipping them into moving, serpentine forms. 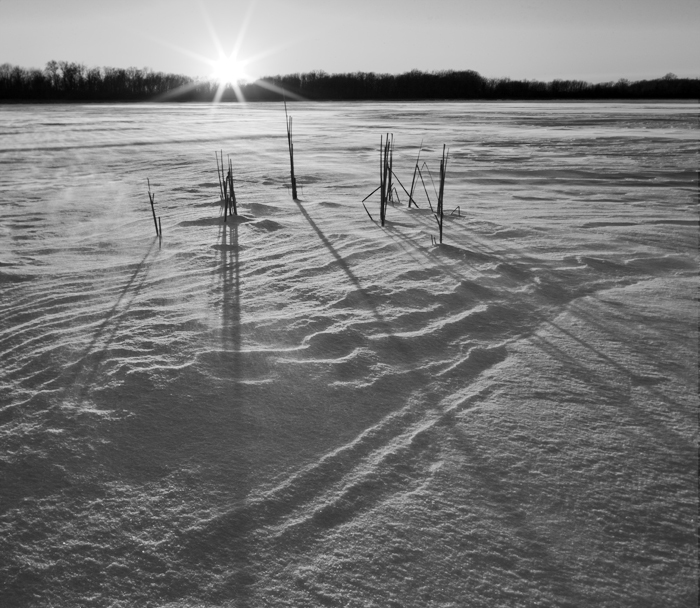 I bundled up and walked out onto the ice with my camera gear just before sunset one evening. Shooting right into the sun right before it dipped below the horizon, I photographed the look and feel of deep winter on the lake. Long shadows cast by the cattails form a triangle. This directs the eye toward the distant tree line., which inn effect serves as a Renaissance-style vanishing point. I rendered this image as a black and white to emphasize its graphic qualities.